RDOSession object is the top level object in the RDO object hierarchy from which all other objects are retrieved. To be able to use RDOSession object properties and methods, log on to a MAPI session first by either setting the MAPIOBJECT property or calling Logon, LogonExchangeMailbox or LogonPstStore methods. RDOAccounts, read-only. Returns the collection representing mail, store and address book accounts in the current profile. Outlook 2002 and up only. MsgBox "You have selected " & Recips.Count & " recipients"
string, write-only. Sets the authentication key - see Security. RDOCategories collection first attempts to read the category list from the default store in the profiles (where Outlook 2007 stores it). If no categories are present in the default store, Redemption tries to read the categories list from the registry if Outlook 2003 or older is installed. Setting this property to true forces LogonExchangeMailbox method to set the PR_PROFILE_UI_STATE property to 0x4100 to force MAPI to encrypt the data. Setting this property to true forces LogonExchangeMailbox method to set the CONNECT_IGNORE_NO_PF bit in the PR_PROFILE_CONNECT_FLAGS property to tell MAPI that it is Ok to connect even if the PF store is not available. Note that only Outlook 2010 and the standalone version of MAPI understand this property. RDOAddressEntry, read-only. Returns the address entry representing the default user identity in the current MAPI session. Note that if the RDOSession object was initialized by setting its MAPIOBJECT property to Namespace.MAPIOBJECT from OOM, the current user returned by this property can vary depending on the store currently selected in Outlook. If the goal is to retrieve the default mail account, using the first RDOAccount object from the RDOSession.Accounts.GetOrders(acMail) collection might be a better alternative. RDOAddressEntry, read-only. Returns the address entry representing the identity of the current Windows user. Accessing this property does not require an active MAPI session, i.e. it can be accessed even if Logon method had not been called. Note that the properties of the current Windows user are retrieved directly from the Active Directory, which means the parent process must be running under an identity of a domain user and the AD server must be accessible. Returns or sets on of rdoExchangeConnectionMode enum values that indicate the current connection mode used in the profile. When setting the property, only olCachedDisconnected (the same as setting the Offline property to true), olCachedConnectedHeaders , olCachedConnectedDrizzle, olCachedConnectedFull can be used. The account is using cached Exchange mode such that headers are downloaded first, followed by the bodies and attachments of full items. The account is using cached Exchange mode on a Local Area Network or a fast connection with the Exchange server. The user can also select this state manually, disabling auto-detect logic and always downloading full items regardless of connection speed. The account is using cached Exchange mode on a dial-up or slow connection with the Exchange server, such that only headers are downloaded. Full item bodies and attachments remain on the server. The user can also select this state manually regardless of connection speed. The account is using cached Exchange mode with a disconnected connection to the Exchange server. The account is using cached Exchange mode and the user has selected Work Offline from the File menu. The account has a disconnected connection to the Exchange server. The account does not use an Exchange server. The account is not connected to an Exchange server and is in the classic offline mode. This also occurs when the user selects Work Offline from the File menu. The account is connected to an Exchange server and is in the classic online mode. Returns a String value that represents the name of the Exchange server on which the active mailbox is hosted. Read-only. Returns a String value that represents the full version of the Exchange server on which the active mailbox is hosted. If Exchange is not used by the current profile, an empty string is returned. Boolean, read-only. Returns true if the current version of Outlook and all providers in the profile support fast shutdown. Only Outlook 2007 SP2 or higher supports fast shutdown. boolean, read/write. Corresponds to "Send / Receive | Download | On Slow Connectiosn Download Only Headers" in the Outlook UI. Returns RDOJunkEmailOptions object representing profile-wide Junk E-mail options, which are saved in the profile data (registry) as well as the primary message store in case of an Exchange mailbox. Profile and mailbox options are reconciled based on the last modification time. boolean, read-only. Returns true if logged on, false otherwise. Returns full path to the MAPI dll (olmapi32.dll, msmapi32.dll or exmapi32.dll). Returns RDOMAPIFormMgr that exposes MAPI forms in the current MAPI session; it corresponds to the IMAPIFormMgr Extended MAPI interface. IMAPISession Extended MAPI object, read-write. Allows to set the MAPI session to be used without explicitly logging to a MAPI profile. Useful if RDO is used in an environment where a MAPI session is already available (e.g. a COM add-in). If you set the MAPIOBJECT property, do not call RDOSession.Logoff as that will render the original session invalid as well. Important note: if you set this property to Namespace.MAPIOBJECT property from the Outlook Object Model and your code is running outside the outlook.exe address space (i.e. it is not a COM add-in) some RDO features (RDOFolder.ACL, GetSharedDefaultFolder, GetSharedMailbox, etc) will not function properly due to bugs in the MAPI COM marshaling support. By default this property is true, which causes Redemption to use the MAPI_TIMEOUT_SHORT flag when logging to a MAPI profile (Logon, LogonExchangeMailbox, LogonPstStore). If one of the MAPI providers does not finish initialization within 5 seconds or so, the call will return MAPI_E_TIME_OUT error. Reset this property to false if you are accessing Exchange over a slow or high latency network. Returns a string representing the version of the MAPI system (olmapi32.dll, msmapi32.dll or exmapi32.dll). Offline Boolean. read/write. Sets the "Work Offline" option in the current session. Note that to affect the Offline state in Outlook, you must use the MAPI session returned from Namespace.MAPIOBJECT property in OOM and run in the outlook.exe address space (which means your code must be in an Outlook COM add-in or a VBA script). Note: this property is only supported in Outlook 2007 or newer. Returns a String value that represents the full version of Outlook. If Outlook is not installed, an empty string is returned. This can be set either to a window handle (HWND) or to an object that supports the IOleWindow interface (such as Explorer or Inspector objects in the Outlook Object Model). Setting this property to 1 forces Redemption to use the value returned by the GetForegroundWindow Windows API function, setting it to 2 uses the value from GetDesktopWindow. Setting that property allows MAPI to display dialog boxes when needed, for example when logging to a profile (Logon, LogonExchangeMailbox), opening a message store (LogonPstStore, AddPstStoreWithPassword, GetStoreFromID, GetSharedMailbox) or when resoling names (ResolveName, Resolve, etc). This property has no effect when running in a service. string, read-only. Returns the name of the currently used MAPI profile. RDOProfiles, read-only. Returns a collection representing the list of profiles for the current Windows user. Normally, Redemption methods that require autodiscover XML (such as LogonHostedExchangeMailbox, GetSharedMailbox, free/busy methods, etc.) look (each in a separate thread) for the autodiscover XML in a few predetermined HTTP locations with a timeout of 5 seconds. A lookup in the Active Directory however, especially if the remote server cannot be contacted through LDAP, can take a long time to time out. Set SkipAutodiscoverLookupInAD property to true if you are connecting to a hosted Exchange server. Leave it as false if you are connecting to an on-premises Exchange serer that does not publish autodiscover through HTTP. Returns RDOSignatures collection representing Outlook signatures in the current profile. Returns RDOSocialConnectors collection representing Social connectors (such as Facebook or LinkedIn) configured in the current profile. userToFind = "user@domain.demo"
RDOStores, read-only. Returns the collection of stores in the current profile. RDOTimezones, read-only. Returns collection representing time zones available in Windows. String, read-only. returns the Redemption file version, e.g. "5.10.0.9602"
SMTPAddress - string. The SMTP address of an Exchange mailbox for which autodiscover XML is to be cached. Create a one-off entry id corresponding to the specified name, address type and address. Useful if you need to set the flag (MAPI_ONE_OFF_NO_RICH_INFO) governing whether a message will be sent in the RTF format or not. This method does not require an active MAPI session. UseUnicode - optional, boolean. Determines whether the name and address are embedded in the Unicode format. Note that Outlook 2000 cannot handle one-off entry ids in the Unicode format. Logs off from the current MAPI session. Note: If you are setting the RDOSession.MAPIOBJECT property to Namespace.MAPIOBJECT from the Outlook Object Model or another RDOSession, do not call Logoff as it will render the original session invalid. MsgBox "There are " & Session.Stores.Count & " stores in the default profile"
Logs to the specified profile. ProfileName - string, optional. If ProfileName is not specified or is an empty string, the default profile is used. Password - string, optional.Presently this parameter is only used by the PST provider if the PST store is protected with a password. This is *not* a Windows account password. ShowDialog - boolean, optional. If true, the dialog selection dialog is used. NoMail - boolean, optional. If true, MAPI session is initialized without starting the MAPI spooler. Log to a temporary profile that points to the specified Exchange mailbox. Exchange only. User - string. Name, address or distinguished name identifying the mailbox, e.g. "UserName", "user@mydomain.com", "/o=MyCompany/.../cn=UserName"
ServerName - name or address of the Exchange server., e.g. "mail", "mail.mydomain.com". Similar to LogonExchangeMailbox, logs to a temporary profile that points to an Exchange mailbox owned by the specified SMTP address. The connection settings are retrieved using Exchange Autodiscover Service and a temporary profile is created that uses RPC-over-HTTP (ROH) to connect to the mailbox under Outlook 2013. When Outlook 2016 is used, the profile is automatically configured by the MSEMS provider to use either MAPI-over-HTTP or RPC-over-HTTP depending on the Exchange Server version and its settings. No credentials prompt will be show under Outlook 2010 or newer. 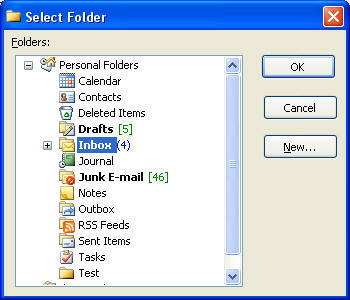 Under Outlook 2007, the prompt is still shown. The dialog will use the window specified by the RDOSession.ParentWindow property as the parent window. SMTPAddress - string. The SMTP address of the user who owns the mailbox. This parameter is used to retrieve the autodiscover XML that contains the connection settings. UserName - string. The user name to be used to log to the specified mailbox. In most cases, the user name is the same as the SMTPAddress parameter, but can also be in the Domain\Name form when NTLM authentication is used. Password - string. the mailbox password. LogonPstStore method, in addition to the Logon and LogonExchangeMailbox methods and setting the MAPIOBJECT property, allows to log to MAPI. Path - string, required, path to the PST file. If the file does not exist, a new PST store will be created. Format - integer, optional. The format of the PST file if a new store is to be created. Can be one of the rdoStoreType enums: olStoreDefault (1), olStoreUnicode (2), olStoreANSI (3). DisplayName - string, optional. The display name of the store if one is to be created. Password - string, optional. The PST file pssword. Encryption - one of the rdoPstEncryption enums, optional. Specifies the encryption level to be used when creating a new PST file. Returns RDOPstStore object. The same store can be retrieved after calling LogonPstStore from the RDOSession.Stores.DefaultStore. TempSession.LogonPstStore "c:\temp\archive_test.pst", 1, "Archive PST Store"
SMTPAddress - string. The SMTP address of an Exchange mailbox for which autodiscover XML is to be retreiveed. UserName - string, optional. Use ranem to be used for authentication when retrieving autodiscover. If not specified, Redemption attempts to use the identity of the current local user. FolderType - integer. The type of default folder to return. Accepts the same values as Namespace.GetDefaultFolder method in Outlook Object Model (olFolderInbox, olFolderContacts, etc). Returns an RDOFolder object given its full path, e.g. "\\Personal Folders\Inbox". Note that a folder path (unlike the entry id) is not guaranteed to be unique, e.g. you can have multiple stores called "Personal Folders", in which case GetFolderFromPath can fail. FolderPath - string, full folder path in the form "\\Store name\Parent Folder Name\Folder". If store name is not specified, the default store is assumed. Returns an RDOMail object created on top of a specified MSG file. FileName - string. A fully qualified path to the MSG file (e.g. "c:\temp\test.msg"). CreateNew - Boolean, optional (default value is false). Determines whether RDO opens an existing file (an error will be raised if the file does not exist) or creates a new MSG file. GetSelectFoldersDialog Returns RDOSelectFoldersDialog object that allows to display the "Select Folder" dialog and allows to customize the dialog in the ways not possible through the RDOSesion.PickFolder method call. Creates a new MSG file and returns a message (RDOMail or one of the derived types, such as RDOContactItem) created on top of MSG file. Unlike RDOSession.GetMessageFromMsgFile (which can also create a new MSG file if CreateNew parameter = true), you can specify the MSG file format (default, Unicode or ANSI) and the message class of the new item so you always get back the right item kind rather than the generic RDOMail. MessageType - variant, optional. Either string specifying the message class (e.g. "IPM.Contact") or one of the rdoItemType values (integer), e.g. olPostItem. 'Below we will get back a contact since we explicitly specify the message class ("IPM.Contact"). EntryIDStore - (optional). string representing the entry id of the message's parent store. Flags - (optional). integer flags to be used to call IMAPISession::OpenEntry. By default MAPI_BEST_ACCESS (0x10) is used. This parameter is most useful if you need to bypass the cached mode in Outlook 2003. E.g. passing MAPI_NO_CACHE (0x200) + MAPI_BEST_ACCESS (0x10) will open the message in the best access mode bypassing the cached store. EntryIDStore - (optional). string representing the entry id of the folder's parent store. Flags - (optional). integer flags to be used to call IMAPISession::OpenEntry. By default MAPI_BEST_ACCESS (0x10) is used. This parameter is most useful if you need to bypass the cached mode in Outlook 2003. E.g. passing MAPI_NO_CACHE (0x200) + MAPI_BEST_ACCESS (0x10) will open the folder in the best access mode bypassing the cached store. Returns RDOSelectNamesDialog object which can be used to display the contents of the address book. EntryIDStore - string representing the entry id of the store. Flags - (optional). integer flags to be used to call IMAPISession::OpenMsgStore. By default MAPI_BEST_ACCESS (0x10) is used. This parameter is most useful if you need to bypass the cached mode in Outlook 2003. E.g. passing MDB_ONLINE(0x100) + MAPI_BEST_ACCESS (0x10) will open the store in the best access mode bypassing the cached store. EntryID - string representing the entry id of the address entry object. Flags - (optional). integer flags to be used to call IAddrBook::OpenEntry. By default MAPI_BEST_ACCESS (0x10) is used. This parameter is most useful if you need to bypass the cached mode in Outlook 2003. E.g. passing MAPI_NO_CACHE (0x200) + MAPI_BEST_ACCESS (0x10) will open the address entry in the best access mode bypassing the cached store. For the one-off entry ids (e.g. created using RDOSession.CreateOneOffEntryID), this methods does not require an active MAPI session. EntryID - string representing the entry id of the address list object. Flags - (optional). integer flags to be used to call IAddrBook::OpenEntry. By default MAPI_BEST_ACCESS (0x10) is used. This parameter is most useful if you need to bypass the cached mode in Outlook 2003. E.g. passing MAPI_NO_CACHE (0x200) + MAPI_BEST_ACCESS (0x10) will open the address list in the best access mode bypassing the cached store. NameOrAddressOrObject - can be a string representing the Exchange mailbox name or address or an RDOAddressEntry or an RDORecipient object. FolderType - integer. The type of the folder. Accepts the same values as Namespace.GetDefaultFolder method in Outlook Object Model (olFolderInbox, olFolderContacts, etc). Returns RDOStore object representing the given user's mailbox. Returns IRDOExchangeStore object representing the given user's mailbox. Similar to GetSharedMailbox, but allows to provide various flags used when creating the store entry id (use Admin privilege etc) and opening the store. EntryIDFlags - a combination of rdoCreateStoreEntryIDFlags enums (see below). GetSharedMailbox method uses OPENSTORE_HOME_LOGON | OPENSTORE_TAKE_OWNERSHIP. OpenStoreFlags- flags to be used when calling IMAPISession::OpenMsgStore. GetSharedMailbox method uses MDB_NO_DIALOG | MAPI_BEST_ACCESS | MDB_TEMPORARY | MDB_NO_MAIL. EntryIDFlags - Optional, variant. A combination of rdoCreateStoreEntryIDFlags enums (see GetSharedMailboxEx above). If not specified, OPENSTORE_HOME_LOGON | OPENSTORE_TAKE_OWNERSHIP are used. OpenStoreFlags- Optional, variant. Flags to be used when calling IMAPISession::OpenMsgStore. (see GetSharedMailboxEx above) If not specified, MDB_NO_DIALOG | MAPI_BEST_ACCESS | MDB_TEMPORARY | MDB_NO_MAIL are used. Returns RDONickNames collection representing nicknames from a particular profile, file or message store. ProfileOrFileName - variant, optional. Either a string (profile name of file name) or an RDOStore object. If not specified, and there is no active MAPI session (i.e. you did not call Logon or set the MAPIOBJECT property), will return the nick names for the default profile. If there is an active session, the nicknames form the current profile will be returned. If specified, Redemption will check if the profile with the given name exists (see example) and return nicknames for that profile. If the profile with the given name does not exist, Redemption assumes that a fully qualified file name is specified (e.g. "C:\temp\Nicknames.NK2") and will attempt to open the file. If an RDOStore object is passed, GetNicknames will attempt to retrieve the nicknames stored in a hidden item in the Inbox of the specified store. If neither profile nor file exist, or the no store is specified, an error will be raised. Returns RDO Object (RDOMail, RDOFolder, etc) form the corresponding Outlook Object Model object. Normally, to retrieve an RDO object from an Outlook object, it is necessary to call RDOSession.GetMessageFromID. That call however opens another instance of the message, and if modifications are made to both objects, can produce an conflict error. GetRDOObjectFromOutlookObject method will use the MAPIOBJECT property exposed by the Outlook objects in the same manner used by the Safe*Item objects. OutlookObject - object. The following objects are supported: messages (MailItem, ContactItem, etc), MAPIFolder, AddressEntry, Store, Attachment). Unwrap - optional, boolean. If true, for messages, Redemption will use IMAPISecureMessage.GetBaseMessage. For the stores, IProxyStoreObject will be used. GetWindowsUser(Name, NameKind) Returns an RDOAddressEntry object corresponding to the specified name, which can be a display name, primary SMTP address, NT style user name (domain\user), etc. GetWindowsUser (just like RDOSession.CurrentWindowsUser) does not require an active MAPI session and can be called without calling Logon or LogonExchangeMailbox. Checks whether the two entry ids refer to the same MAPI object. Note that entry ids cannot be directly compared and multiple entry ids can refer to the same object (e.g. in case of long term vs. short term entry id). The SetLocaleIDs method sets identifiers that define a messaging users locale. The locale info is only used by the dynamically created profiles when LogonExchangeMailbox is called. If SetLocaleIDs is called after logon, an error will be raised. LocaleID - integer. The locale identifier (LCID) to be used for this messaging user. CodePageID - integer. The code page identifier to be used for this messaging user. Displays the Pick Folder dialog box. This is a modal dialog box which means that code execution will not continue until the user either selects a folder or cancels the dialog box. Returns an RDOFolder object corresponding to the folder that the user selects in the dialog box. Returns Nothing when the dialog box is canceled by the user. SelectedFolder - optional, RDOFolder. If specified, this folder will be initially selected. 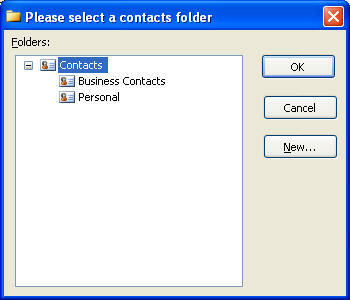 If not specified, the Inbox folder is selected when the dialog is displayed. Caption - optional, string. If specified, determines the Select Folder dialog caption. If not specified, defaults to "Select Folder" (localized appropriately in French/German/Italian/Portugese/Russian/Spanish along with other dialog box controls). ParentWindow - optional, integer. If specified, the handle of the dialog's parent window. If not specified, the dialog is shown as a child of the currently active window. sffHideNewButton (1) - hides the "New" button, preventing the user from creating a new folder. pffNoSizing (4) - prevents the user from resizing the dialog. pffHidePublicFoldersStore (8) - hides the Public Folders store but leaves all the other stores visible (unless pffHideParentFolders is also specified). pffShowStoresOnly (16) - only shows the top level folders of the stores in the current profile. "New" button will be hidden. AllowedFolderType - optional. One of the rdoItemType enums. If not specified, all folders are displayed. If is specified, only the folders with the DefaultItemType property matching the specified value are displayed. The following values are supported: olMailItem, olAppointmentItem, olContactItem, olTaskItem, olJournalItem, olNoteItem. Shuts down MAPI in the current process space. No MAPI calls will be allowed if this method succeeds. An error will be raised if the current version of Outlook and all providers in the profile do not support fast shutdown. Fires when a new message is delivered to the Inbox of the default store. EntryID - string, entry id (in hex) of the newly delivered message. Note that under Exchange, the entry id is a short term entry id. To retrieve the long term entry id, open the message (e.g. using RDOSession.GetMessageFromID), then read the EntryID property from the RDOMail object. OnOfflineStateChange Fires when the user clicks on the "Work Offline" button/menu item in Outlook or when the RDOSession.Offline property is set.